A Spanish language billboard on busy Market St. in San Francisco. Does this signal a more culturally inclusive Forest Service? Not long ago I was walking on Market Street in San Francisco’s Financial District when I came across a billboard from the U.S. Forest Service. Aside from Smoky Bear advertisements admonishing care with flames in forests (you know the ones, “Only YOU can prevent forest fires!”), I’ve never seen an advertisement for the Forest Service, let alone one in the middle of a city that is at least a few hours drive from any national forests. More striking was the language. The poster was in Spanish! And it made me very happy. The forest is closer than you believe (El Bosque mas cerca de lo que crees ) it announces with a web site on the bottom which translates as “find out about the forest” (Descubre El Bosque). For urbanites who are used to government billboards in a multitude of languages (here in San Francisco they’re often in Chinese, Tagalog, Russian, and, of course, Spanish), this may not seem like such a big deal. Trust me, it is. Our federal public land agencies aren’t known for their diversity, whether among visitors or employees. So this effort to reach out to Latinos is something worth noting and replicating. You might say that most people, even with limited English, would understand the billboard without translating it into Spanish. But that’s missing the point. 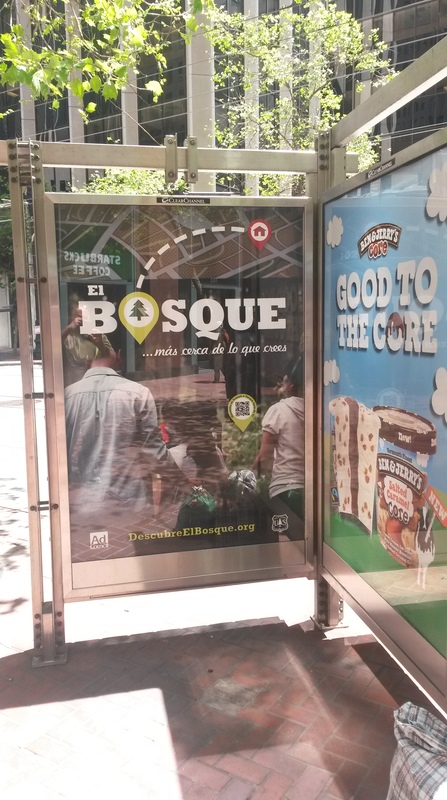 A Spanish language advertisement signals a cultural awareness and openness that says to the reader that s/he belongs in national forests. Of course it isn’t enough. The Forest Service not only needs to reach out to diverse populations through advertisements and websites, it also needs to look more like the nation. And even that is not enough. It needs to change its culture to reflect the diversity of our collective experiences. And what goes for the Forest Service, goes for the the Bureau of Land Management, the Fish and Wildlife Service, and my beloved National Park Service. Making concerted and sincere efforts now will ensure the sustainability of our magnificent public lands in the future. But for now, I’ll take it. Kudos to the United States Forest Service for putting up that billboard and having a Spanish language website. Now, if we can just get the National Park Service to emulate this!